Despite proclamations to the contrary, evidence shows that the Nigerian government continues to perpetuate poverty in the country by practice of the enrichment of a few officials at the expense of millions of people. As a result, governments at federal and state levels underfund vital sectors of the economy except for the political sector where individuals at the very heart double-dip into the public purse. Mathematically, just a few of these officials, for the privilege of serving in political office, earn in a year what over 112 Nigerians living below the poverty line cannot earn in a lifetime. According to the Revenue Mobilization Allocation and Fiscal Commission (RMAFC), the government agency which has the responsibility of determining the remuneration of political office holders, governors and deputy governors are entitled to N2,223,705 and N2,112,214 as annual salaries. This is outside of numerous allowances accruable to them. RMAFC is also, by the provision of the constitution, empowered to determine the remuneration of all legislators. A Senator is entitled to a whopping sum of N12,939,549 per annum, as basic salary and allowances. These 24 individuals have earned almost 10 billion naira as salaries and privileges for serving in public office. Meanwhile, the poverty report of Nigeria Bureau of Statistics (NBS) pinned the poverty rate at 67.1% of the total population, indicating that over 112 million Nigerians live below the poverty line. In sharp contrast to the reality of those over 112 million Nigerians living below the poverty line, Nigeria, at both state and federal levels, has remained committed to enriching a few politicians to the detriment of the majority of her citizens. It must be pointed out that the amount relating to governors excludes any other largesse they must have enjoyed while in office. For instance, the controversial security vote, which has become the honey pot of many state governors, was not considered because the funds and how it is spent remains shrouded in secrecy. Privileges such as medical care, security and vacation were also not added. The implications of this misplacement of financial priority on the part of the government are not far to seek. Across the country, schools have been shut down because of poor funding, yet both state and federal governments have continued to fund this infinitesimal group, paying them humongous salaries and pensions. In the last two years, for instance, Ladoke Akintola University of Technology has been shut down for more than 10 months because both joint owners, Oyo and Osun state governments, have refused to fund the institution adequately. Meanwhile, the two states have continued to fund a robust pension package for all former governors and deputy governors. 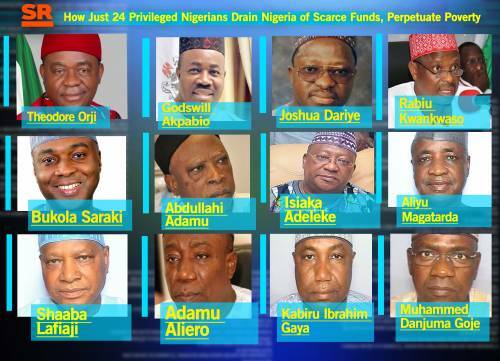 An extensive investigation by Saharareporters revealed 13 states that have continued to fund 16 ex-leaders who also are currently earning fat salaries from the coffers of the federal government. These states include: Abia, Akwa Ibom, Anambra, Kano, Kwara, Osun, Sokoto, Gombe, Adamawa, Ebonyi, Zamfara, Rivers, and Lagos. Mr. Isiaka Adeleke, the first civilian governor of Osun state and a three-time member of the Nigerian Senate up until his death a few months ago, was enjoying a life time pension which had run up to N446million in seven years. Osun State, with thousands of unpaid workers and civil servant pensioners, has used up about half a billion naira in pensions to just one former governor who was in office for only one year (1992-1993). and 4th with 80.2% and 74.2% respectively. But these three states have paid over half a billion naira as pension to three former governors. Ahmed Sani Yerima who was governor of Zamfara state in 1999-2007 has earned N182m in 10 years since leaving office. In total, Yerima has earned N426mfrom both state and Federal governments, as a former governor and now as a member of the Senate. Furthermore, Gombe and Sokoto States have paid Mohammed Danjuma Goje and Aliyu Magartakarda Wamakko N297m and N200m respectively as pension since the duo left office as governors. government is bound by law to provide for him as a former governor. Yerima and such people as the former Yobe governor, Bukar Abba Ibrahim (who was recently caught in a dingy hotel sleeping with two girls), George Akume of Benue, Rabiu Kwankwanso of Kano and Samuel Egwu of Ebonyi, have scooped up hundreds of millions from the government’s purse since 1999 and will continue until 2019 at least. That would be 20 years of unbroken earnings for just five men people in a country where 112 million live in abject poverty. Kwakwanso, Egwu and Akume have respectively earned N578m, N157m and N244m since 1999 that they entered government, with close to one billion naira accruing to Bukar, who was Yobe governor for 8 years and has earned N865m as pensions since vacating the governor’s seat 10 years ago. Also firmly in the one billion naira circle is the current Minister for Transportation, Rotimi Amaechi, who has earned N1billion since 2007 when he became governor of Rivers state. Amaechi has earned N965 million as pension from that state, and now earns more besides as Minister. Equally fascinating is Akwa Ibom State, which considering its oil producing status is one of the richest states in the country, but that has never translated to improved living conditions for the Akwa Ibom people. That does not include the likes of Godswill Akpabio, who has received N654millionas pensions in the last two years alone. What is worse is the revelation that pension payments and other entitlements were drawn and passed into law by some of the politicians considered in this report when they were sitting governors. In 2007, Buka Abba Ibrahim, who is one of the highest-earning pensioners in Nigeria, signed the pension law in Yobe state. In 2010, Saraki implemented his version in Kwara State while Amaechi did the same in 2014 in Rivers State. Babatunde Fashola, the Minister for Power, Works and Housing is a beneficiary of the two-fold pension benefit system enshrined in the Lagos State pension act 2007. As a former governor who served two terms, Fashola is entitled to two houses – in Lagos and Abuja – as retirement benefits. This is irrespective of the RMAFC prescription that provided 300 percent of basic salary as severance for Certain Political Office Holders and Judicial Officers. For these 24 super-Nigerians, who have interpreted, and deployed the apparatus of state to serve them for life. Beyond the naira and kobo that flow voluminously into their accounts, they enjoy security protection that is separate and distinct from that being provided by their current offices. Armed policemen and officers of Department of State Security Service (DSS) are deployed to ensure their safety as ex-governors or deputies, and for their families too. In addition, many of them ensured they would, and are enjoying the services of a contingent of endless domestic staff of cooks, gardeners and drivers, courtesy of the state government. What might Nigerian states have looked like, were these funds not being drained by insensitive and selfish politicians? In Zamfara State, Saharareporters projects that the hundreds of millions being paid to former Governor Yerima in pensions could have procured vaccines to confront the outbreak of fatal diseases in the state. Had that been in place a few years ago, the outbreak of Type C Cerebrospinal Meningitis which claimed 215 of the 336 lives lost nationwide may have been avoided. On the subject of health, that sector remains one of Nigeria’s most decrepit, largely because of poor funding, with many Nigerians, including children, dying daily of treatable diseases such as malaria. The humongous sums being claimed as pensions and bogus allowances by these politicians, who give themselves and their families the best medical care in foreign hospitals, would have done a great deal to strengthen the health sector. What about the education sector? Only recently the United Nations Emergency Fund (UNICEF) reported that approximately 10 million school age children are out of school in Nigeria. One of the factors for the high rise in the statistics of out of school kids has predominantly been affordability and accessibility of schools. With 9.7 billion naira, at least 10 public schools could have been built, greatly reducing the number of children who are out of school. Viewed another way, that sum could have funded LAUTECH, for instance. With the millions of naira being paid in pensions to former governors and deputy governors, that institution would have fared much better. According to different reports, LAUTECH needs only about N4 billion to clear staff salaries and get the institution back on its feet. But while top politicians, many of who send their children to expensive schools abroad, continue to drain these critical funds, over 28,000 young Nigerians have been kept out of school as an opportunity. 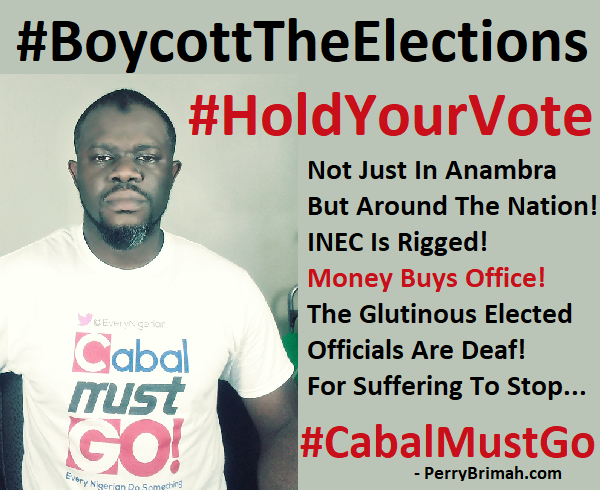 The Nigerian government is widely-adjudged to be one of the most expensive around the world, but it is becoming increasingly more expensive because of the cost of serving and sustaining a small group of current and past political office holders. The time has come when Nigerians must loudly demand that these officials, who identify and denounce corruption only when it is on the other side of the road, cut down on dubious government expenses such as salaries, pensions and allowances, and reprioritize the country’s financial engagement so that such critical sectors as education and health can develop, thereby translating into better living conditions for the populace.